The 12th at Augusta by Larry Dyke depicts the famous twelfth hole at Augusta National Golf Course in Atlanta, Georgia. 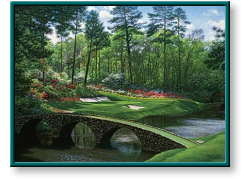 "The Amen Corner at Augusta is the most critical part of the Masters Tournament. It can make or break a champion. 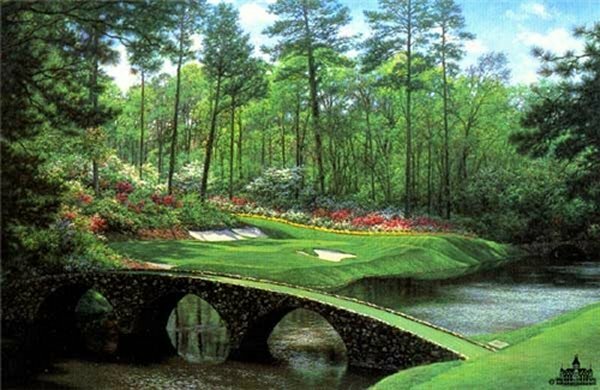 The whole course is really beautiful, but the Amen Corner makes me forget how pretty the flowers are." This print was issued & released in 1996. Add $9.50 for shipping, handling, & Insurance. Image Size: 19.5" x 29.75"
Add $19.50 for shipping, handling, & Insurance. Currently valued at $3,100.00 according to InformArt! Comes with free shipping, handling, & Insurance. The 12th at Augusta copyright© 1996 by Larry Dyke and is prohibited from being copied without permission.